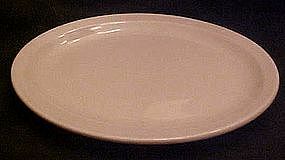 Vintage pink Tepco platter measures 9 1/4" x 11 1/2" and has the rolled edge under the rim. Minimal utensil scratches, no chips or cracks or wear spots. I have 4 available, all are identical except only one is marked PA-CE-CO China USA, which is Tepco. Price is for each.